The eyes are golden and seem relatively large and round. 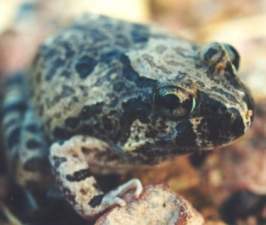 The frog is usually a sandy brown, but the markings can vary. However, the legs usually have rounded stripes that are a darker brown than the background skin. Their call is a fast "unk", and when there are many calling, it can sound like popcorn being made. The average adult length of the Ornate Burrowing frog is 45 millimetres. Found throughout the top end, and down the east coast to Sydney. This species is well­adapted to burrowing when there is little water, and is often found far from the coast and in arid environments. Found in wide range of habitats from coastal rain and wet sclerophyll forest to dry woodlands of the interior. A burrowing species, it is usually found active after rain, or on warm, humid nights.